QAPCO holds an 80% share in the project while QP holds the remaining 20%. The complex will produce 1.4MMTA of ethylene, 850,000 metric tonnes per annum (KMTA) of high-density polyethylene (HDPE), 430 KMTA of linear low-density polyethylene (LLDPE), 760 KMTA of polypropylene, 83 KMTA of butadiene and py-gasoline. Qatar Petroleum (BP) holds an 80% share in the project, and Shell holds the remaining 20% share. The complex, on its commissioning, will be capable of processing 1.1 million tonnes per year (mtpa) of ethylene, 170,000mtpa of propylene, 1.5mtpa of MEG, 300,000mtpa of LAO and 250,000mtpa of OXO. Qatar plans to launch the sale of a 15% stake in a new state-run holding company grouping Qatar's petrochemical, MTBE, fertilizer and steel businesses to Qatari nationals in a public offering next month. France's Atofina said Tuesday it finalized the purchase of Enichem's 10% share in Qatar Petrochemical Company on September 16. The deal raises Atofina's interest in Qapco to 20 %, making it the only remaining partner of the national oil company Qatar Petroleum which owns the other 80%. This deal allows Atofina to consolidate its direct involvement in two major projects to develop its petrochemicals operations in Qatar through the creation of Qatofin, a joint venture held by Atofina (36%), Qapco (63%) and Qatar Petroleum (1%), announced in June 2002. Atofina there raises to 22.2% its interest in the 1.3-mil mt/yr ethane cracker due for start-up in 2007 at Ras Laffan, in the north-east Qatar. Atofina raises its share from 16,1% to 19.29 % in Qatar Vinyl Company (QVC), the chlorochemicals complex located in the industrial zone of Mesaieed which came on stream in the spring of 2001. The complex will use ethane feedstock and have the capacity to produce 500,000mt of ethylene and 450,000mt of high density polyethylene yearly. Q-Chem is a 51:49 joint venture between the Qatar General Petroleum Corp and Chevron Phillips. The multi-billion Qatari Riyals project is a joint venture between QP (51%) and Chevron Phillips Chemical Company LLC (49%). Construction on the project started almost three years ago after His Highness the Heir Apparent Sheikh Jassem Bin Hamad Al Thani laid the Foundation Stone December 21, 1999. The first project, to be known as Q-Chem II includes QP (51%) and Chevron Phillips Chemical (49%) as shareholders. Q-Chem II will have new HDPE and Normal Alpha Olefins plants in Mesaieed adjacent to present Q-Chem plant. The second project will be known as Qatofin with a shareholding profile showing QAPCO (63 %), Atofina (36 %) and QP (1 %). Qatofin will establish a world scale LLDPE plant in Mesaieed, adjacent to QAPCO facilities. A third Project established between QP, Q-Chem II and Qatofin will include an ethane cracker and a 120 km. pipeline to transport the ethylene produced by the cracker project. The shareholding profile in this project is Q-Chem II (53.31%), Qatofin (45.69 %) and QP (1.00 %). Chevron Phillips Chemical Company LLC and Qatar Petroleum of Qatar have signed a joint venture agreement for the development of a world-scale petrochemical company in the State of Qatar, officials of both companies said today. The project involves the development of an ethylene cracker with the capacity to produce up to 1.2 million metric tons per year, a polyethylene plant capable of producing more than 750,000 metric tons per year, associated utilities and offsite facilities. This venture marks the second cooperation undertaken by the two companies in the State of Qatar. Qatar Chemical Company LTD (Q-Chem), joints venture between Qatar Petroleum and Chevron Phillips Chemical, is currently constructing a 500,000-metric-ton-per-year ethylene plant, a 450,000-metric-ton-per-year polyethylene plant and a 47,000-metric-ton-per-year hexene-1 plant in Messaieed, Qatar. This plant is on schedule for a third quarter 2002 start-up. Qatar General Petroleum Corporation, now known as Qatar Petroleum, was established in 1974 as a national corporation completely owned by the State of Qatar. In line with the industrialization plan of the State of Qatar, QAPCO is a joint venture project initiated by Qatar General Petroleum Corporation (QGPC) to utilize the ethane gas associated with petroleum production. Established in 1974, with production beginning in 1980, QAPCO is a unique pioneering petrochemical venture in the Gulf Region, and the Middle East. QAPCO is a multi-national joint venture between Qatar General Petroleum Corporation (QGPC) holding 80% , Elf Atochem of France (10%), and Enichem of Italy (10%) of the shares. Producing Ethylene, low density Polyethylene (LDPE) and solid Sulphur, QAPCO’s Ethane feedstock requirement is met by QGPC. The company markets its products worldwide, with a substantial increase in the annual projected turnover, with the completion of planned expansion projects. Ethylene annual production capacity is 525,000 MT. The expansion project being completed in 1996. The Ethylene annual production increased to 245,000 MT. In 1997, LDPE plants operated without major defects. As production costs and quantity of raw materials, the production increased by 28,000 mt. QAPCO today is the largest producer of LDPE in the Middle East with annual capacity of 360,000 metric tons (MT). Production comes from two lines with annual capacity of 180,000 MT each using tubular and vessel reactor technology. Applications for LDPE include films, injection moulding, blow moulding, pipes, cables, coating, roto moulding and other different applications. Annual capacity of pure prilled sulphur is 70,000 MT. Qatar Petrochemical Co (Qapco; Mesaieed, Qatar), a joint venture of Qatar Petroleum, Atofina, and EniChem, says it plans to hike ethylene capacity at Mesaieed from 525,000 m.t./year, to 720,000 m.t./year. Power for the whole process is supplied by a 110MW unit, which is already part of the QAPCO plant. Salt is imported from outside the plant to feed the chlorine unit. This is broken down into chlorine (260,000t/yr capacity), caustic soda (295,000t/yr capacity) and hydrogen. The hydrogen is used as a fuel gas. The chlorine is fed into the ethylene dichloride (EDC) unit, along with ethlyene from the QAPCO plant (capacity of 106,000t/yr). The EDC unit produces 175,000t/yr for sales, as well as 193,000t/yr of EDC for the vinyl chloride monomer (VCM) unit. This EDC is fed in with 52,000t/yr of ethylene (again from the QAPCO facility) as well as 5,000t/yr of caustic soda. This produces 230,000t/yr of VCM for sale. The remaining 290,000t/yr of caustic soda is sold. The Qatar Vinyl Company (QVC) was formed in 1997 to create the project. It is a subsidiary of four companies. The Qatar Petrochemical Company (QAPCO) is the biggest shareholder, with 31.9%. Norsk Hydro is next with a 29.7% share. Elf Atochem has 12.9%. Qatar General Petroleum Corporation (QGPC) has 25.5%. QGPC is 80% owned by QAPCO, with 10% owned by Elf Atochem and Enichem respectively. Qatar Petroleum and ExxonMobil Chemical Company, a division of Exxon Mobil Corporation, announced today that they have signed a Statement of Intent (SOI) to conduct a feasibility study for a world-scale, ethane-based cracker and ethylene derivatives complex in Ras Laffan Industrial City, Qatar. The SOI was signed by H.E. Abdullah bin Hamad Al-Attiyah, Qatar's second deputy premier, minister of energy and industry and chairman of Qatar Petroleum, and by Mr. Daniel S. Sanders, president, ExxonMobil Chemical Company. The Qatar Petroleum and ExxonMobil joint study will define the technical and commercial aspects of a world-class petrochemical growth platform in Qatar. The complex will utilize ethane feedstock from new gas development projects in Qatar's North Field and supply competitively advantaged products to Asia and Europe. Exxon Mobil Corporation, through its subsidiaries, has had a presence in Qatar since 1935. Qatar Petroleum and ExxonMobil are currently working together to diversify the use of the North Field gas into new areas in addition to LNG, including the supply of pipeline gas to domestic and regional customers, Gas-to-Liquids (GTL) and other projects. The Government of the State of Qatar and an Exxon Mobil Corporation subsidiary, ExxonMobil Qatar GTL Limited, announced today that the parties have entered into a Heads of Agreement (HOA) for an approximately $7 billion, Gas-to-Liquid (GTL) project, which would be the world's largest single, fully integrated GTL project. The facility would be built at the Ras Laffan Industrial City in Qatar. The agreement was signed by H.E. Abdullah bin Hamad Al-Attiyah, Second Deputy Premier and Minister of Energy and Industry for the State of Qatar, and Harry J. Longwell, Director and Executive Vice President, Exxon Mobil Corporation. Qatar Petroleum and ExxonMobil have signed a memorandum of understanding in New York for the construction of a 1.6-mil mt/yr of ethylene cracker at Ras Laffan in Qatar, Qatari officials said Monday. Qatar Petroleum and ExxonMobil Chemical Qatar Limited, a subsidiary of Exxon Mobil Corporation (NYSE:XOM), today announced they have signed a Heads of Agreement (HOA　基本合意書) to progress studies for a proposed $3 billion world-scale petrochemical complex in Ras Laffan Industrial City, Qatar. The announcement was made by His Excellency, Abdullah Bin Hamad Al-Attiyah, Qatar Second Deputy Premier and Minister of Energy and Industry, and by Michael J. Dolan, President, ExxonMobil Chemical Company, at a signing ceremony today in Doha. The proposed petrochemical complex includes a world-scale, 1.3 MTA steam cracker and associated derivative units, including polyethylene and ethylene glycol, and will employ ExxonMobil's proprietary steam cracking furnace and polyethylene technologies. It will utilize feedstock from gas development projects in Qatar's North Field and serve markets with premium products in both Asia and Europe. Currently, start-up of the proposed facility is estimated in 2012. QAFAC was established as a Qatar joint stock company to build, own and operate facilities at Mesaieed in Qatar for the production of methanol and methyl tertiary butyl ether (MTBE) for sale to customers worldwide. The QAFAC plant is designed to produce 832,500 metric tons per annum (MTA) of methanol and 610,000 MTA of MTBE. Methanol production for 2002 was 772, 604 metric tons - lowevr thanthe deisgnb capacity due to the extyended turnaround at the begining of the year. MTBE production was 576,173 MT for 2002, higher than 2001. During 2002, the major exports of methanol were made to countries in Asia , India, Europe and the Arabian Gulf. MTBE was exported to the US, Europe, the Middle East and Arabian Gulf. A total of 84 vessels, up from 70 in the 2001, of various parcel sizes were safely loaded and sailed out of QAFAC's dedicated berth for MTBE and methanol during the year. The company is owned by Qatar Petroleum (QP) 50%, Chinese Petroleum Corporation (CPC) 20%, Lee Chang Yung Chemical Industry Corporation (LCYCIC) 15% and International Octane Limited 15%. GIC is one of the largest regional financial institutions in the Arabian Gulf region. Established under the auspices of the Gulf Cooperation Council (GCC) in 1983, GIC is equally owned by the governments of the six GCC member states: Bahrain, Kuwait, Oman, Qatar, Saudi Arabia, and the United Arab Emirates. We provide services that focus on the development of private enterprise and economic growth in the Gulf region. Our clients include governments, quasi governmental institutions, the corporate sector and other major investors either based in or who are active in the region. GIC maintains a unique focus on the Gulf region. Headquartered in Kuwait, the authorized capital is US$ 2.1 billion and total shareholders equity is over US$ 1.0 billion. Our regional, international, sectoral and product expertise means we are able to help clients based or operating in the Gulf region achieve their commercial and investment objectives. Our intimate knowledge of the region's business, legal and regulatory environment enables us to provide clients with effective and practical solutions that fit their investment needs. Gulf Investment Corporation (GIC) was established in 1983 to further investment opportunities in the Gulf Cooperation Council (GCC), to support regional co-operation and to stimulate private enterprise. As the Gulf's premier investment institution, this is a role that the Directors, Management and Staff are proud to undertake. Since 1983, GIC has been a principal investor in over 40 projects in various economic sectors covering agriculture, manufacturing, industry and services in the GCC region. GIC used to fully own Gulf International Bank (GIB), which was acquired in 1991. As a result of a merger between GIB and Saudi International Bank (SIB), GIC retained ownership of 72.5% of GIB. Subsequently in April 2001, that remaining ownership was sold directly to the six governments that comprise the GCC: Bahrain, Kuwait, Oman, Qatar, Saudi Arabia and the United Arab Emirates. The divestment of GIB coincided with the completion of a strategy review by GIC in which McKinsey & Co. was the advisor. A new strategy for GIC was approved by its Board of Directors in 2001 that focuses on GIC's role in principal investments in GCC projects and ventures in addition to an emphasis on GIC's role as a promoter of Gulf investment products and services to clients inside and outside the region. The commitment of GIC to the Gulf region represents the mainstay of the new strategy. Gulf Petrochemical Industries Co. is Bahrain's first venture into the petrochemical industry. It was formed in 1979 as an equal partnership between the Government of Bahrain, Saudi Basic Industries Corp. and Petrochemical Industries Co., Kuwait. The objective was to use the country's natural gas to produce basic petrochemicals to contribute to the economic development of Bahrain. Production of ammonia and methanol (1,000 tons/day) started in 1985. Capacity was increased to 1,200 tons/day of each product in 1989. In 1996 and 1997 a 1,700 tons/day granular urea plant and associated storage and marine export facilities were added to the complex. Urea is produced by synthesis for liquid ammonia and gaseous carbon dioxide, which is a byproduct of the ammonia production process. The new plant was designed with an initial production capacity of 1,700 tons of urea per day, and produces enough fertilizer to help grow the wheat required to produce 24 million loaves of bread a day. The entire complex is self-sufficient in terms of all utilities and houses its own medical center, fire brigade and training facilities. "In just under two decades we have grown to become a major petrochemical industrial venture, contributing to the international growth and development in this prestigious field," said H.E. Isa bin Ali Al Khalifa, minister of oil and industry and chairman of Gulf Petrochemical Industries Co. We have earned an excellent international reputation for quality, safety, reliability and care for the environment." Since inception GPIC has established itself as a leading producer of petrochemicals in the international markets. It is renowned for its achievements in reliable production, efficiency of operation, safety and concern for the environment. GPIC maintains a fishery near the factories as an assurance that no damage is being done to the environment - be it sea, land or air. As a result of this project, thousands of fish, spawned at the fishery, are given to the local poor throughout the year, and 10 percent of these fish are released into the sea. All this is part of its drive to protect the environment. Qatar Petroleum (QP) and Shell Chemicals Limited (Shell) today signed in Doha a Letter of Intent (LOI) for the development of a world-scale ethane based cracker and derivatives complex in Ras Laffan Industrial City, Qatar. Qatar Petroleum (QP) and The Royal Dutch/Shell Group of Companies (Shell) signed today in Doha a Heads of Agreement (HOA) for the development of a large-scale Liquefied Natural Gas (LNG) project located in Ras Laffan City, Qatar. The project is called Qatargas 4. Qatar Petroleum and PetroWorld Ltd. of South Africa signed, today, a Heads of Agreement for the development of a Large Scale Fuel Grade Methanol Project. The signing ceremony, held at Qatar Petroleum’s Headquarters in Doha, was attended by senior officials from Qatar Petroleum and the South African company. The targeted output of the Ras Laffan-based project to be will be 12,000 to 15,000 tons of methanol per day. The agreement was signed by His Excellency, Abdullah Bin Hamad Al Attiyah, Minister of Energy and Industry, Chairman of Qatar Petroleum on behalf of Qatar Petroleum and Her Excellency, Phumzile Mlambo-Ngcuka, Minister of Minerals and Energy of South Africa, representing the South African company. In this project, the State of Qatar will be represented by Qatar Petroleum (51%) and the South African Government will be represented by PetroWorld Limited (49%). Qatar Petroleum (QP), a state-owned corporation, is responsible for all phases of the oil and gas industry in Qatar while PetroWorld Ltd. is a joint venture owned by Petroleum Oil and Gas Corporation of South Africa (50%) and TransWorld Group of Companies (50%). Qatar Petrochemical Co. (Qapco) says it is planning to invest $250 million to build a third low-density polyethylene (LDPE) plant at Mesaieed, Qatar. The plant will have a capacity of 250,000 m.t./year and is due to come onstream in 2010-11, the company says. It will increase Qapco's LDPE capacity to 645,000 m.t./year. Qapco will select technology for the LDPE unit by the second half of next year, Hamad Rashid Al-Mohannadi, vice chairman of Qapco says. The company will complete a $220-million expansion of ethylene capacity at Mesaieed from 525,000 m.t./year, to 720,000 m.t./year, also in the second half of 2007, Al-Mohannadi says. Qapco is an 80-20 joint venture between Industries of Qatar (IQ; Doha) and Total Petrochemicals. Qatar Petroleum owns 70% of IQ and the rest is publicly traded. Qatar Petroleum (QP) and Sasol Chevron today announced plans to evaluate the expansion of ORYX GTL from 34,000 bbl/day to 100,000 bbl/day. QP and Sasol Chevron have signed a Memorandum of Understanding (MOU) for the ORYX GTL Expansion project and have discussed the technical and business principles that will support the planned increase in the output of the foundation plant to 100,000 bbl/day. This will involve defining the feasibility of a three (3) train, 65,000 bbl/day facility with an expected start up by 2009. QP and Sasol Chevron have also signed a Letter of Intent (LOI) to examine GTL Base Oils opportunities in Qatar. QP and Sasol Chevron have agreed to pursue the opportunity to develop a 130,000 bbl/day upstream/downstream integrated GTL project based on the Sasol Slurry Phase Distillate Process and utilising resources from the North Field. This will involve defining the feasibility of a six (6) train facility with an expected start up by 2010. These efforts will lead to the establishment of a Heads of Agreement (HOA) for the project. Sasol Chevron was formed in order to take advantage of the synergies of Sasol's and Chevron's Gas To Liquids strengths. Sasol has the world's most advanced Fischer-Tropsch technology. Chevron has extensive global experience with respect to natural gas utilisation, product marketing and hydrotreating technology. Sasol and Chevron signed a Memorandum of Understanding today for the creation of a new global alliance to implement ventures based on Sasol's gas-to-liquids (GTL) technology. Qatar Petroleum (QP) and Qatar Shell GTL Limited (Shell), a company of the Royal Dutch/Shell Group, today signed an integrated Development and Production Sharing Agreement (DPSA) that provides for the fiscal and legal terms for the Pearl GTL project. 'Pearl GTL' is the name given to the project announced by QP and Shell last October at a Heads of Agreement signing in Doha. The agreement reaffirms Shell's long-term commitment to Qatar and confirms the company as a leader in GTL development. The Pearl GTL project comprises the development of upstream gas production facilities as well as an onshore GTL plant that will produce 140,000 barrels per day (bpd) of GTL products as well as significant quantities of associated condensate and liquefied petroleum gas. The project will be developed in two phases with the first phase operational in 2009, producing around 70,000 bpd of GTL products with the second phase to be completed less than two years later. The project includes the development of a block within Qatar's vast North Field gas reserves, producing substantial quantities of natural gas. Under the Auspices of His Highness, Sheikh Hamad Bin Khalifa Al-Thani, Emir of the State of Qatar, His Excellency Sheikh Hamad Bin Jassim Bin Jabr Al-Thani, First Deputy Prime Minister and Minister of Foreign Affairs, officially inaugurated, on behalf of His Highness, the SEEF Ltd. Company's new Linear Alkyl Benzene plant in Mesaieed today. The ceremony was attended by dignitaries and guests from Qatar and abroad. Built at a cost of about US$300 million, Linear Alkyl Benzene (LAB) plant is situated adjacent to Qatar Petroleum Refinery in the industrial area of Mesaieed, about 40 Kms from Doha. Its proximity to the QP Refinery was selected for its source of feedstock and sharing of various common utilities. The LAB plant is designed to produce 100,000 metric tons of Linear Alkyl Benzene per annum which is a detergent intermediate used for manufacture of environmental friendly household detergents. SEEF Limited is a joint stock company with Qatar Petroleum holding 80% of the shares while 20% is held by United Development Company (UDC). The Company was incorporated under the law of State of Qatar and was registered in July 2004. United Development Company (UDC) was established in July 1999 as one of the leading private sector shareholding companies in the State of Qatar, in the Middle East, and has been listed on the Doha Securities Market since June 2003. Through a combination of substantial project activities and commercial enterprise, UDC has made substantial progress toward becoming the first-choice private sector joint venture partner for international investors in Qatar. Since 1999, UDC has moved from an initial program of detailed project research into specific investments and joint venture developments in petrochemicals, district cooling and land reclamation. The company prides itself on its ability to research and select quality investment opportunities as these arise, at home and overseas. The company is empowered to invest in financial instruments in Qatar, and also to act as a sponsor for international companies entering the Qatar market for the first time. Seef Limited is a joint venture between Qatar Petroleum (QP) and UDC, with UDC holding 20% of the shares. Seef will produce and sell Linear Alkyl Benzene (LAB), a downstream petrochemical feedstock for the world's detergent manufacturing industry. Total project cost is estimated at around $ 289 million (QR 1.05 billion). Project construction started in May 2004 at Mesaieed Industrial City, adjacent to the Qatari Petroleum refinery, and completion is expected by the end of 2005. Commercial production is planned for January 2006, with QP responsible for the operation and maintenance of the plant as well as marketing of the products. Qatar Petroleum and ExxonMobil dropped plans Wednesday to build a gas-to-liquids (GTL) plant in Qatar due to spiraling costs and will instead turn their attention to developing part of the country's huge North gas field. Qatari Energy Minister Abdullah al-Attiyah said other projects in Qatar were not under threat and ground would be broken Thursday for a multi-billion-dollar GTL plant with Royal Dutch Shell. Costs for that facility, which processes gas into refined market-ready products, have risen to as much as $18 billion from a 2003 estimate of around $5 billion. The Exxon/QP GTL scheme, signed in 2004, had an initial budget of $7 billion. Qatar Petrochemical Co. Ltd (QAPCO), a joint venture of Industries of Qatar and Total Petrochemicals, has chosen Basell’s Lupotech T technology for a new 250 KT per year low density polyethylene (LDPE) plant to be built in Mesaieed, Qatar. The start-up of the new plant is expected in 2011. “This is the 50th Lupotech T technology license worldwide and we are very pleased to work together with QAPCO in their important expansion project,” Just Jansz, president of Basell’s Technology Business, said yesterday at the signing ceremony in Doha. Qatar Petroleum International (QPI) a wholly-owned subsidiary of Qatar’s state-owned Qatar Petroleum and Royal Dutch Shell yesterday signed A Memorandum of Understanding (MoU) aimed at identifying and developing international projects of mutual interest throughout the energy chain. The MoU was signed on behalf of QPI by HE the Deputy Premier and Energy and Industry Minister Abdullah bin Hamad al-Attiyah and by Linda Cook, executive director of Royal Dutch Shell. Attending the signing ceremony were Nasser al-Jaidah, CEO of QPI, and Jeroen van der Veer, chief executive of Shell. “Qatar Petroleum’s goal to become a leading global energy company can only be attained through its participation in the development of key international projects. “This agreement with Shell, a top player in the global energy business, represents a significant step in our quest to meet this ambitious target, said al-Attiyah. “We are very pleased to see our growing partnership with Shell take on a new dimension and look forward in the successful delivery of this joint project,’ added al-Attiyah. Cook said: “We are delighted to team up with QPI in joint pursuit of global business opportunities. Our combined experience and strength within the energy sector make for an ideal partnership. Qatar Petroleum International (QPI) and China’s Sinopec have signed a memorandum of understanding for construction of an ethylene plant with the capacity to produce between 700,000 and 800,000 tons of ethylene a year in China. As of now, the location of the plant has not been decided. Nasir Jaidah, QPI’s Managing Director, told reporters that Qatar would supply the condensate feedstock for the plant, which is expected to start production in 2013. Jaidah pointed out that the ethylene plant would be QPI’s first investment in China. At present, China produces about 10 million tons of ethylene a year, while the country’s demand is close to 24 million tons a year. Ethylene is the most produced organic compound in the world; global production of ethylene exceeded 75 million metric tons per year in 2005. To meet the ever increasing demand for ethylene, sharp increases in production facilities have been added globally particularly in the Gulf countries. Ethylene cracker capacities in the Gulf region alone are projected to increase from eight million tons in 2000 to 28 million tons by 2010. Norsk Hydro ASA has today completed the sale of its 29.7 percent ownership interest in Qatar Vinyl Company (QVC) to Qatar Petroleum. The transaction represents net proceeds to Hydro of USD 136 million (NOK 735 million). The transaction is expected to result in a gain of approximately NOK 100 million to be recorded in the third quarter results. This completes the divestment of Hydro’s Polymers activities. Hydro entered into an agreement to sell its Polymers activities to INEOS in late May 2007, consisting of production facilities in Norway, Sweden and the UK, and the 29.7 percent ownership interest in QVC. The sale to INEOS was completed February 1, 2008, excluding the QVC ownership interest as Qatar Petroleum exercised its pre-emptive right to acquire the QVC ownership interest. Qatar Petrochemical Company (QAPCO), has signed with Uhde of Germany the EPC contract for launching its new LDPE-3 plant in Mesaieed. In a press conference following the signing ceremony, Dr. Mohd Yousef Al-Mulla, GM of QAPCO, said that throughout its history, QAPCO has undergone some significant revamps and expansions, including the expansion of the Ethylene Plant (EP2), which was successfully completed in 2007 and boosted its annual ethylene production capacity from 525,000 metric tons to 720,000 metric tons. Dr. Al-Mulla referred to the underway Qatofin project, a joint venture between QAPCO (63%), Total Petrochemicals of France (36%) and Qatar Petroleum (1%), for establishing a world-class Linear Low Density Polyethylene (LLDPE) plant in Mesaieed, that shall receive the ethylene delivered from a new 1,300,000 metric tons ethylene cracker plant, set up in Ras Laffan through a 120 km pipeline to produce 450,000 metric tons of linear low density polyethylene per year, and it is expected to commence in the 4th quarter of 2009. It is worth mentioning that Qatar Petrochemical Co. (QAPCO), a joint venture between IQ (80%), and Total Petrochemicals France (20%), was the first petrochemical company in the Middle East region, established in 1974 as a multinational joint venture to utilize associated and non-associated ethane gases for the production of Ethylene and of various grades of LDPE, marketed under the 'LOTRENE' brand name. QAPCO today is supplying its productions of Ethylene and polyethylene to local and to the world strategic international markets. The LDPE-3 Project will be using the excess ethylene produced by QATOFIN and QAPCO, and it is planned to produce annually 300,000 metric tons of low density poly ethylene using the high pressure tubular reactor technology from "Basell" of Germany, the leading technology provider in this application, which was acquired in 2007. In addition to the new 300,000 metric tons low density polyethylene train, the LDPE3 Project includes a new Central Control Room common for all QAPCO and QATOFIN plants and the integration with existing utility and logistics facilities of QAPCO and QATOFIN. The LDPE3 Project is planned to be completed on December 2011 and will be managed by QAPCO's Project Management team. This project will be the last in the matrix of projects connected to RLOC. i.e Qatofin, Q-Chem and LDPE-3. Qatar Petroleum International (QPI), China National Offshore Oil Corporation (CNOOC), and another partner will jointly build a petrochemical project with an investment of USD 5.8 billion in the southmost Chinese province of Hainan, told foreign media. Moreover, the Qatari company will construct a petrochemical project with USD 4 billion in Vietnam. 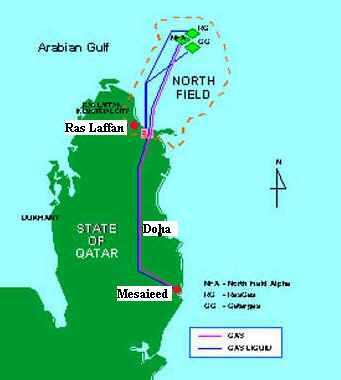 Both these projects will use the LPG (liquefied petroleum gas) made in Qatar. The QPI CEO Nasser Al-Jaidah said that the Asian market owned huge potentials, especially China. He thought the two projects would help QPI not only expand its market but also make use of its LPG, but did not disclose its stake in each of the two projects. The Hainan-based project is expected to gain approval from Chinese regulators in the second half of next year, predicted the CEO. Each year, it will consume 3.8 million tons of LPG and turn out such products as polypropylene. Earlier reports told that the first phase of the project would produce 2.6 million tons of olefin, and that the capacity would possibly jump to 5 million tons in the future. Qatar Petroleum (QP) and ExxonMobil Chemical Qatar Limited, a subsidiary of Exxon Mobil Corporation, announced they have signed an agreement to progress the joint development of a world-scale petrochemical complex in Ras Laffan Industrial City, Qatar. The proposed complex would include the world's largest steam cracker and polyethylene plants, and one of the world's largest ethylene glycol plants. The announcement was made by His Excellency, Abdullah bin Hamad Al-Attiyah, Qatar Deputy Premier, Minister of Energy and Industry and QP Chairman, and by Steve Pryor, President, ExxonMobil Chemical Company, at a signing ceremony held in Doha. “The State of Qatar has embarked on ambitious programs to utilize and develop its hydrocarbon resources. This agreement represents another important step to achieve the vision of His Highness the Emir Sheikh Hamad Bin Khalifa Al-Thani, for the optimal utilization of the country’s natural resources,” His Excellency Al-Attiyah said. The proposed petrochemical complex would include a 1.6 MTA steam cracker, two 650 KTA gas phase polyethylene plants, and a 700 KTA ethylene glycol plant. The project will employ ExxonMobil's proprietary steam cracking and polyethylene process, and product technologies. It will utilize feedstock from gas development projects in Qatar's North Field and produce a range of premium products to serve global petrochemical demand, with a particular focus on the growing Asia markets. Start-up of the proposed facility is estimated in late 2015. Qatar gathered chief executives from the biggest energy companies to celebrate reaching an annual production capacity of 77 million tons of liquefied natural gas, underscoring its rank as the world’s biggest LNG exporter. The Persian Gulf state may further increase its capacity by as much as 10 million tons a year if it can improve efficiency at its production units, Energy Minister Abdullah al-Attiyah told reporters. Exxon Mobil Corp.’s Rex Tillerson, Royal Dutch Shell Plc’s Peter Voser and ConocoPhillips’ Jim Mulva were among the chief executives attending the ceremony at the industrial city of Ras Laffan yesterday. “If in the future we want to expand, we will expand as a revamp and de-bottlenecking,” al-Attiyah said yesterday, adding that constructing new LNG units would be a costlier option. While Qatar is recognized as the biggest LNG exporter and holds the world’s third largest natural gas reserves, its gas fields also supply rising volumes of natural gas liquids such as propane, butane and condensate. These products, collectively known as NGLs, have commercial uses similar to crude or refined oil products, boosting Qatar’s overall energy sales. Qatar will be able next year to pump 1.19 million barrels of NGLs a day, according to a forecast by the Paris-based International Energy Agency. The country’s NGL output will for the first time exceed its production capacity for crude, which the IEA estimates will be 1.02 million barrels a day in 2011. Qatar’s combined capacity for producing NGLs and crude will overtake that of its OPEC partners Algeria and Libya, according to the agency’s forecast. “It very clearly pushes Qatar up the ranks of oil producers and also -- because of the semi-refined nature of some of these -- the rankings of the refined-product producers as well,” said Lawrence Eagles, global head of commodities research at JPMorgan Chase & Co. in New York, speaking in a telephone interview in November. The tiny nation of 1.6 million people has the third-largest reserves of natural gas after Russia and Iran and is the second- smallest producer of crude in the Organization of Petroleum Exporting Countries. Ecuador is the smallest. OPEC quotas only cover crude, not NGLs. The world-scale project would produce cost-competitive products to be marketed worldwide. 250,000 tpy of Oxo derivatives. INEOS Technologies is pleased to announce that it has licensed its INEOS EPS process for the manufacture of regular and flame retardant expandable polystyrene to EPS Qatar at a new complex to be built in the Doha region, Qatar. The 50ktpa INEOS EPS plant will produce a wide range of expandable polystyrene grades to cover all the applications from construction to packaging and serve the growing demand in the GCC region. The plant will feature expansion capabilities to reach 100kta in a second phase. Ihab El Zahaby, CEO of EPS Qatar, stated: "We are pleased to have selected INEOS Technologies' EPS process as an integral part of our petrochemical project. The INEOS EPS process will provide EPS Qatar with an advanced and robust EPS process with advantaged economics and broad product reach." EPS Qatar is planning to set up a 50,000 tonne/year expandable polystyrene (EPS) plant in Mesaieed industrial city in the south of Doha, Qatar at a cost of €110m, its CEO Ihab Barakat ElZahaby said on Tuesday. The company — sole proprietary of Qatari entrepreneur Hitmi Ali AlHitmi who has been in real estate business — signed a technology licensing agreement with Switzerland-headquartered chemicals producer INEOS earlier this month, ElZahaby told ICIS by email. The company intends to sell EPS in the Gulf Cooperation Council (GCC), north Africa and Turkey, ElZahaby said. The company intends to complete the EPS plant by the end of 2017 and also has plans to increase the EPS capacity to 100,000 tonnes/year by the end of 2020, he added. It also wants to invest in a styrene unit in the near future, ElZahaby said but gave no further details. The Al Karaana project was initiated with a Heads of Agreement (HOA) between QP and Shell in December 2011, and envisioned the construction of a new world-scale petrochemicals complex in the Ras Laffan Industrial City north of Qatar. The complex was to be operated as a stand-alone QP-Shell joint venture (80% QP, 20% Shell). QP and Shell’s existing partnerships include Pearl GTL – the world’s largest integrated gas-to-liquids plant located at Ras Laffan, which has boosted Qatar’s position as the world’s GTL capital. The partnerships also include Qatargas 4 -an integrated Liquefied Natural Gas (LNG) asset- in addition to joint downstream and upstream investments in Singapore and Brazil.